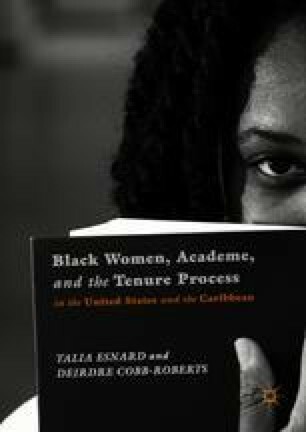 Our work advances a comparative intersectional exploration of Black women in academe. In so doing, we begin to tease out the relative significance and connectedness of socio-historical, cultural, economic, and political contexts, as well as, embedded structures and relations of power that collectively undergird their experiences. In applying this comparative intersectional framework to the examination of Black Caribbean women in academe, we therefore begin with the understanding that their lives are also structurally situated within parallel axes of power. We also bring to bear some fundamental complexities and contentious ways in how they speak of and work within issues of context, structure, power, and agency. Husu, L. (2004). Gate-keeping, gender equality and scientific excellence. In Gender and excellence in the making (pp. 67–76). Luxembourg: Office for Official Publications of the European Communities. https://www.uni-frankfurt.de/41563255/GenderMainstreaming.pdf. United States Agency for International Development. (2005). A gender analysis of the educational achievement of boys and girls in the Jamaican educational system. Retrieved from http://www.usaid.gov/our_work/cross-cutting_programs/wid/pubs/ga_education_jamaican.pdf.